Immunogen: Unpurified influenza A virus (H1N1 A/PR/8/34) for primary intranasal immunization, boosted intravenously with purified influenza A virus disrupted with Triton X-100 for 45 min at 37°C. 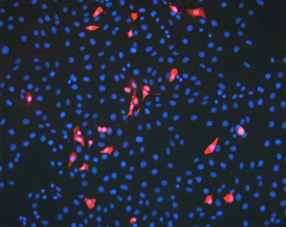 Figure 2: Immunofluorescent analysis of Vero cells using Influenza A Virus, mAb (5D8) diluted 1/1000 + secondary polyclonal rabbit anti-mouse Ig FITC conjugated antibody (DAKO F0232) 1/20 + 1% Evans blue colors Influenza A nucleoprotein. DAKO IMAGEN Influenza Virus slides (S6112) were used and the entire infected Vero cells are seen. 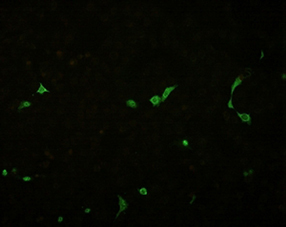 Figure 1: Immunofluorescent analysis of Vero cells using Influenza A Virus, mAb (5D8) diluted 1/1500 + secondary polyclonal goat anti-mouse Ig Fluor 555 conjugated antibody (Alexa A21424) 1/200 + Vectashield mounting medium with DAPI. DAKO IMAGEN Influenza Virus slides (S6112) were used and the entire infected Vero cells are seen.